Q:Can I make 3D ppt to page flip book available on mobile? Mobile is a communication tool which we can leave today. Many people use it to surf online for entertainment or for work. If your 3D page flip book can be view on the mobile phone, it will help you share with your friends or others more easily . Look here to learn how to convert PowerPoint to 3D mobile publication. Step1: After finishing designing, click”Publish” in the navigation bar. 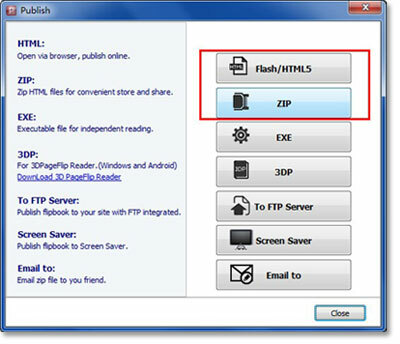 Step2: Choose “html” or “zip” output type. This is the format to help you publish online. Step3: Tick “Also Make Mobile”. 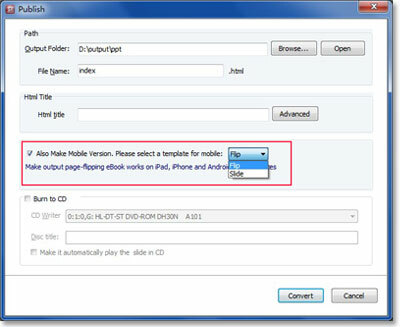 Then convert the PPT page flip publication.